Advance Guarding can provide immediate start Security Officers to Solar Parks anywhere in the UK. 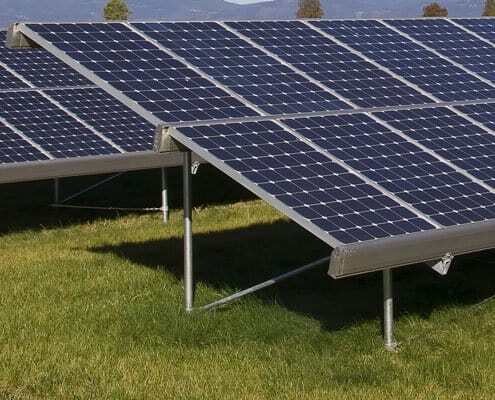 Solar Parks can be built on greenfield or brownfield sites and require superior security to ensure their safety both during construction and when complete and generating power. The problems security contractors face start with the protection of construction equipment together with valuable metal cables and equipment being stored and used in the open countryside until they are fixed or buried and then, after construction, the continuing possibility of damage by theft or vandalism. This security problem requires two stages with initial man-heavy guarding followed by the erection of a physical barrier around the perimeter to protect from both human as well as animal damage, such as deer or farm animals, combined with active CCTV, monitored at an ARC (Alarm Receiving Centre) to recognise intrusion. This is pretty standard stuff to Advance Guarding who probably have more experience than any other private security company in this field as we have protected many, many of the new green, energy efficient parks. From breaking ground it is essential to have a well thought out security program. Advance Guarding will initially provide an On-site Security Officer to act immediately as a visual crime deterrent and the contract costing should allow for the Initial installation of either a complete, temporary, perimeter fence or, as a minimum, the delineation of a protected, protectable area fenced to allow defence against intrusion. Here all valuable equipment is stored whenever not being used. This will normally require 24 hour security guards who can also monitor site access, ingress and egress, for personnel and equipment. At some point a permanent perimeter fence of either palisade fencing with steel supports or deer proof mesh on timber stakes will be installed and this together with CCTV will provide the most cost effective final solution to the park. At Advance Guarding, we can provide a wide range of permanent fencing options that include aesthetically pleasing, strong and effective deer fencing to protect both wildlife and installations. We would suggest that in the areas that are more sensitive, such as around the PV plant, inverters or substations, galvanised steel palisade fencing up to 3 metres high, provides the most effective and durable deterrent to crime and vandalism. Add to this a Smart-Wire passive vibration sensor for added protection and intruder detection, to immediately warn of attempted forced entry. Advance Guarding can supply all this from national depots and temporary fencing within 3 hours of your request. Then for 24 hour / 365 day surveillance of your solar farms for immediate identification of confirmed security breaches. Advance Guarding, design, install and monitor our own BS8418 compliant, integrated technology to meet individual solar farm requirements and enable a swift and effective response to all potential threats. Our standard system includes HD CCTV camera networks which provide high quality images and infra-red capability using the latest IP based cameras, with real time remote viewing over a secure internet connection. In addition and if required, a thermal camera option provides the ability to distinguish easily between animal or human intrusion by recognising their body heat, even in fog or other poor visibility weather conditions. This virtually eliminates false alarms and allows a remote Video Alarm Receiving Centre to identify and avert potential security breaches. An integrated Public Address system enables the ARC to challenge the intruder and issue verbal warnings prior to the dispatch of security personnel or escalation to local police to attend the site. Advance Guarding can provide all this and time it to your schedule. We will also organise preliminary and permanent materials and installation. A specific quotation would be supplied so as to keep your costings accurate. Call Advance Guarding now for all you solar park security needs, 01903 269990.